industry involvement directly from Altium. Altium has announced a free embedded software development toolset for industry-leading semiconductor manufacturer Infineon’s TriCore/AURIX product line as part of their strategic partnership. This toolset was developed as part of a major update to the TASKING compiler for TriCore/AURIX, which adds a number of new features and enhancements for advanced automotive application development. The Lite Edition of the TASKING VX-toolset for TriCore includes a one year license and can be requested now on the Infineon website or the TASKING website. Engineers can use this toolset to develop automotive applications that require high standards of safety, reliability and performance for the AURIX variants within the TriCore microprocessor family. Integrated Pin Mapper. This pin mapper solution saves the developer from the tedious task of managing pin assignments in spreadsheets by making it easy to assign the peripheral module signals to physical pins on the chip. Real-Time Operating System (RTOS) for TriCore. The TASKING RTOS provides a real-time, multitasking kernel designed specifically for time-critical embedded applications that require a high degree of modularity and configuration. Software Platform Builder. 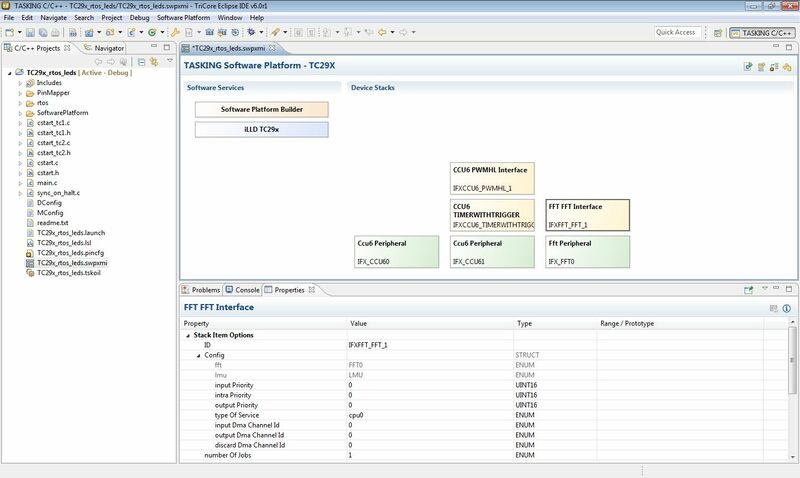 The Software Platform Builder provides the flexibility needed to build advanced microcontroller applications through the use of a unified graphics editor and code generator which can quickly configure low-level drives, C files, header files, and the RTOS. The Lite Edition of the TASKING VX-toolset for TriCore comes with a one-year license and can be requested now on the Infineon website and the TASKING website. Additional information can be found in the Lite Edition v1.0r1 Release Notes. TASKING is an Altium brand. TASKING development tools are used by carmakers and the world's largest automotive Tier-1 suppliers to program microcontroller based power train, body control and safety related applications around the globe. More than ten thousand users rely on the TASKING compilers and debuggers to create richer next-generation applications while achieving optimum reliability, security, and performance. TASKING compilers are also part of Altium Designer and installed on hundreds of thousands of developer’s desktops around the globe. In 2012 the TASKING brand celebrated its 35-years anniversary of technology leadership, quality tools and customer support excellence. Altium Limited (ASX: ALU) is a multinational software corporation headquartered in San Diego, California, that focuses on electronics design systems for 3D PCB design and embedded system development. Altium products are found everywhere from world leading electronic design teams to the grassroots electronic design community. With a unique range of technologies Altium helps organisations and design communities to innovate, collaborate and create connected products while remaining on-time and on-budget. Products provided are Altium Designer®, Altium Vault®, CircuitStudio®, PCBWorks®, CircuitMaker® and the TASKING® range of embedded software compilers. Founded in 1985, Altium has offices worldwide, with US locations in San Diego and Boston, European locations in Karlsruhe, Amersfoort, Kiev and Zug and Asia-Pacific locations in Shanghai, Tokyo and Sydney. For more information, visit www.altium.com. You can also follow and engage with Altium via Facebook, Twitter and YouTube.